…And Finally – the Recital!! I squealed in delight as a thick, yellow envelope from Mr. Video was tossed on my desk. This was the package I had been waiting for! It had finally arrived – the recital video!! On May 22, Eau Claire School of Dance (ECSOD) had their recital. For us, it was a bittersweet day. It marked the end of 5 years of Grace dancing there. It was her first year in competition. The girls in her class had all gotten pretty close; it felt like we had become part of a “dance family.” It was a big year for her, since she was in 4 dances, plus an “extra” skit between numbers. This was the most she’s danced in one show… and she had to do it twice! She was pretty exhausted by the end of the day! For me, it was the end of 4 years of hip hop. It was a great 4 years! The challenges of hip hop were awesome – some nights, I left class feeling both exhausted and exhilarated at the same time. Sometimes, I hurt for a week afterwards, but every minute was amazing (and TOTALLY worth it)! 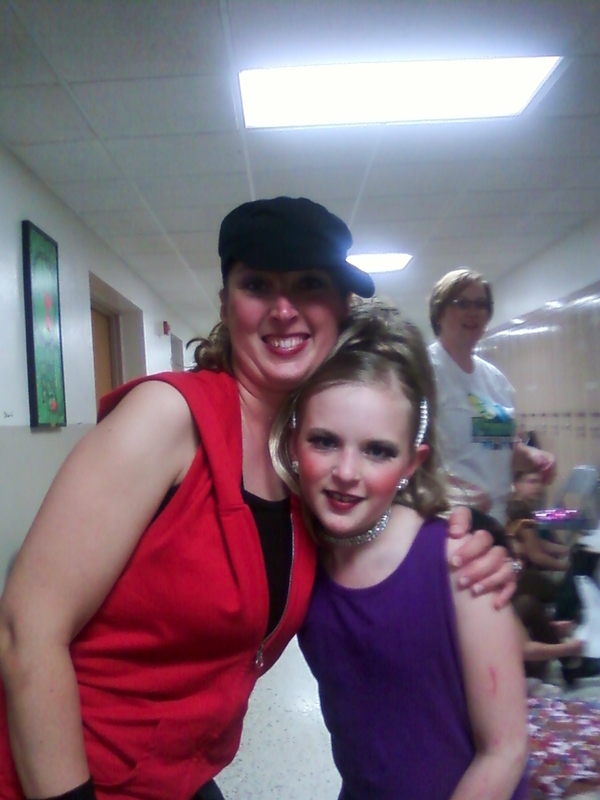 Being a Dance Mom AND dancer provided an added challenge in this years’ recital. Since Grace was in so many numbers, I was doing a lot of running back and forth. Grace was in the very first number, then had some time before her next 2 and the extra. Between those two times, I got to watch some of the recital. In the first show, many of my former preschoolers (and some of Grace’s friends) were dancing. It was fun to watch them! I missed a few though, because they danced shortly before me. I’m looking forward to watching them on the video. Her last numbers were all relatively close together. I’d help her get ready for one, run back out to watch her dance, then come backstage to help her get ready for the next… I definitely got my exercise that day! Grace’s dad, his sister, and parents, were all at the first show. She danced her little heart out, and did great. I did pretty decent in the first show too. Jason, my fiance, was at the second show. It was the first time he had come to see me dance in a show, and I was nervous. I made a LOT of mistakes, but still managed through it. I’ll have to show him the video of the first show (which was the one I ordered), so he can see that I really am not that bad! Grace, on the other hand, probably did a bit better on the second show. By the last number, she was pretty wiped, but her main dances, she rocked ’em! We’re definitely going to miss our friends at ECSOD, not to mention the amazing choreographers! I am hoping we will be able to make it back for shows in the future. They have always been awesome to watch and be a part of! Previous 8 Weeks to go! Next 7 More Weeks!